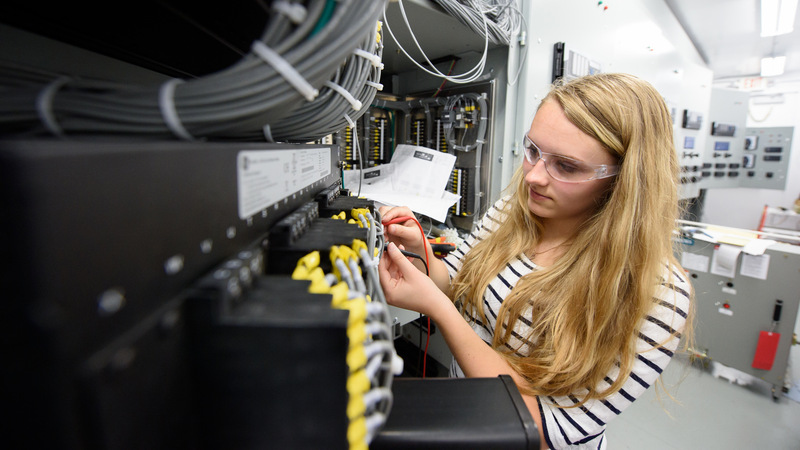 UW-Oshkosh students get hands-on experience in the engineering technology field. In response to the region’s workforce need for engineering technologists, University of Wisconsin Oshkosh Chancellor Andrew Leavitt announced the launch of Campaign Engineering Technology. The campaign is a $10 million fundraising initiative to provide scholarships, internships, K-12 outreach and equipment needs to support the three bachelor’s degrees in engineering technology offered at UW Oshkosh. The bachelor’s degrees offered are in electrical engineering technology, environmental engineering technology and mechanical engineering technology. Matt Jameson ‘96, president and CEO of Jay Manufacturing Oshkosh, will serve as campaign chair. Jameson graduated from UW Oshkosh with a bachelor’s degree in education and serves on the Chancellor’s Advisory Council. John Koker, dean of the UW Oshkosh College of Letters and Science, will serve as campaign co-chair. Koker has overseen the College of Letters and Science at UW Oshkosh since 2007. The engineering technology degrees, which started in 2014 at UW Oshkosh, came out of a need from local manufacturers and industry—and in partnership with the Manufacturers Alliance and the Northeast Wisconsin Educational Resource Alliance (NEW ERA). “This degree program, and this campaign, is a statement about how UW Oshkosh is responding to that need. People have told us this is important for their workforce, and we listened,” said Greg Kleinheinz, Viessmann Chair of Sustainable Technology and director of the Engineering Technology program at UW Oshkosh. UW Oshkosh is looking for partners to support Campaign Engineering Technology. The $10 million fundraising campaign will dedicate more than half of the funds raised, $7 million, to student scholarships. Of the remaining dollars, $2 million is earmarked for K-12 outreach, $500,000 to support student internships and $500,000 for equipment needs. Eighty percent of UW Oshkosh engineering technology students receive some type of financial assistance. Providing scholarships extends beyond helping the individual student, but also directly benefits the local business and local economy. “An investment in Campaign Engineering Technology is an investment northeast Wisconsin,” Rathjen said. 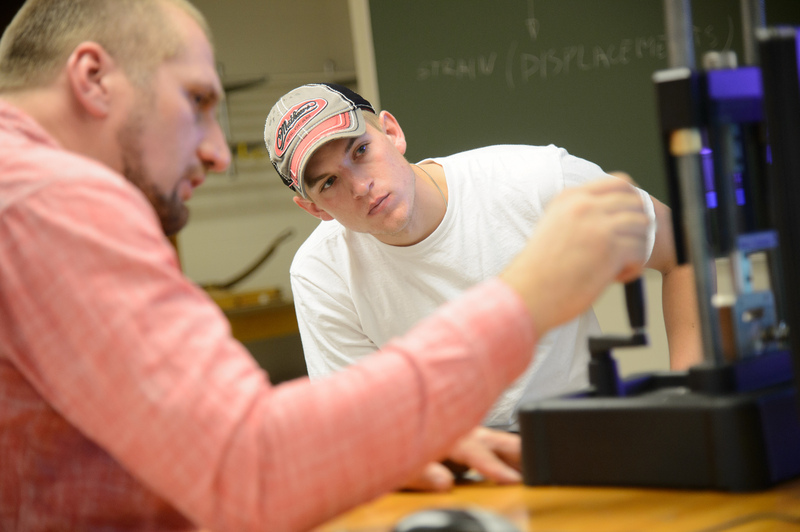 UW-Oshkosh students work in the Environmental Research and Innovation Center (ERIC) lab. The engineering technology program was born out of listening to the workforce needs of local businesses leaders. “We’re looking for people right now; and to find those really qualified people is not an easy thing. There is a shortage,” said Pete Pittner, vice president of the Sheboygan-based Miller Engineers and Scientists. Companies like Miller Engineers and Scientists rely significantly on engineering technologists, as engineering technologists make up 50 percent of their workforce. Campaign and University leaders seek continued partnerships and collaborative opportunities that will allow students in the engineering technology program to earn hands-on education and real-world experience simultaneously—making students familiar with the industry prior to entering the workforce. UW Oshkosh works with students to help find the best career match for their interests—many careers and majors are unknown to students because of the unfamiliarity of an industry or job. UW Oshkosh is looking to expose students to the field of engineering technology. 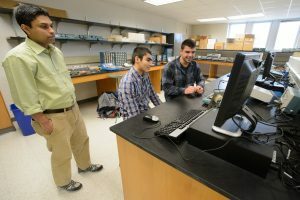 The engineering technology program also provides unique possibilities for nontraditional students who might be working full time as applied engineers with two-year degrees. As employees look to grow in their career, earning a bachelor’s degree can be a benefit for the employee and employer. Recently, the Wisconsin Department of Workforce Development (DWD) awarded approximately $140,000 in the form of a Fast Forward grant to UW Oshkosh to fund a cohort of engineering technology students to complete their bachelor’s degree. Each of the 33 students, representing 10 regional businesses, receives a customized approach to degree completion based on his or her background and experience. UW Oshkosh’s vision is to bring engineering technologists to local businesses will have a positive impact on the local economy. “What are the hardest occupations to fill in northeast Wisconsin? Every year, for the last five years, based on our surveys and research with manufacturers, engineering technology is in the top five hardest to fill,” said Ann Franz, NEW Manufacturing Alliance director. A UW-Oshkosh student works with a faculty member.